FAQs About Leah Freeman Case ??? Re: FAQs About Leah Freeman Case ??? Wud that be good enough for you??? Do you think he had his his car/person checked out??? If not, shud it have been? Lets say Littlethings's " scenario" is accurate .. lets say Leah did go off crying be herslef, upset and wanted to be alone... lets say she did recluse herself till lets say 11:15??? Also, lets say the time the shoe was picked up ..wasnt accurate at all???? If his alibi would've checked out, it would've been good enough for me. It wouldn't seem very likely to me that after being spotted on Central multiple times, Leah went off crying somewhere for two hours without being seen, and then started walking again and got abducted around 11:15. If she wanted to be by herself, she could have went home and shut herself in her room. I think she was headed to the Haga residence. If Leah went home, it would've took her another 9 minutes past the corner of Elm and Central, and then it's almost certain Nick would've caught up with her before she got home. If his alibi would've checked out, it would've been good enough for me. Is that all ?? I am understanding that you feel TM's alibi (of being at work) wud been enough for you to eliminate him entirely??? Even though he was the one who brpought in her shoe and was the one who established the origin of Leahs likely murder/foul play? The main reason I would eliminate him if his alibi checked out is because she would've had to be abducted after 11 if it was him. I don't think Leah had enough time to make it home and leave again later without Nick catching up to her on the way home, I don't think she was curled up in a ball outside somewhere crying where nobody could see her, and I don't think she was out walking around for two hours with Nick driving around looking for her. Everything I know about this case leads me to believe that Leah was headed towards the Haga residence and made it to Elm sometime between 9:14 and 9:24. To take a page out of your book and inject some logic, your last sentence says it all. TM turning in the shoe is what made the police start thinking foul play might have been involved. The police still thought Leah was a runaway before he turned in that shoe. If TM was guilty, there was no reason in the world for him to turn that shoe in or even keep it in his house. If guilty, he would've been better off to throw the shoe in a river somewhere rather than bring attention to himself by turning it in. A guilty TM turning that shoe in would almost be equivalent to John Gardner keeping Chelsea King's clothes and then turning them in 5 days later saying he heard about a missing girl and thought they might belong to her. Yes, I do think they should have. I wish Leah would have been considered an endangered missing person right from the beginning.
" 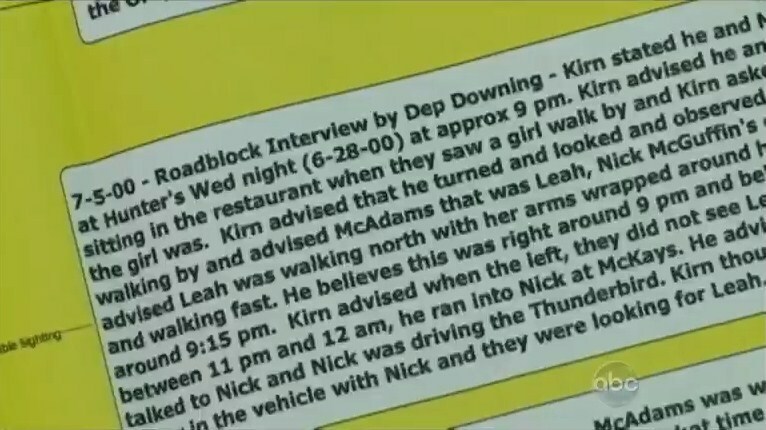 From the docs that were showed on 20/20 (what little we can see of some of them) it appears that in a roadblock interview one of the guys (I think it's Kirn) may have spoken to Nick later in the evening at McKay's, that Nick was driving the Thunderbird, and possibly that Nick had someone in the vehicle." also I did not see such a statement.. about him talking to Nick while he was in a thunderbird.. I will also find it interesting to see what he says.. This would be from a roadblock interview (I remember reading that this was conducted after Leah's shoes were found), and in the docs pictured the date is 2000. If you review the 20/20 footage, it's there. I don't think that info would have affected what Kirn told police 10 years ago. Not so fast.... many ppl who have reported the " findings" of a persons.. remains or articles... have been the perp.. It is a normal reaction for LE to THOROUGHLY chek the person who has discovered the remains or articles of possession of the missing person especially when it comes to her remains being discovered shortly after.. I would've questioned him and if there were inconsistencies, it would've raised a red flag. If it was normal procedure to thoroughly check anybody who turned anything in, I would've gone as far as obtaining search warrants on him, his vehicle, and his property. I would've felt bad to put him through that since it wouldn't seem likely to me that Leah was abducted two hours after she was last spotted. littlethings wrote: I don't think that info would have affected what Kirn told police 10 years ago. I do believe that the FBI wud have taken the bull by the horns as they were involved in the beginning.. I believe if this info (like what LT suggests was said in 2000.. was actually true.. I believe the FBI wud never have let this file sit.. I could see the dated doc that showed the info from Kirn was given in 2000. It isn't much different than what we've already seen in respect to Leah's whereabouts and Nick's actions, though the time is later in the evening when Kirn saw Nick than what I remember seeing before. Kirn said he saw Leah, that he talked to Nick and Nick was driving the Thunderbird, that someone was with Nick looking for Leah. Mostly all things that we've read before, so I don't know what the FBI could have made of that info to take anything by the horns. Their involvement was in a missing persons case. I would be curious to see what is in the FBI file, though, or the reports from other agencies that were involved for that matter. AJ, you keep referring to my theory so let me clarify what I really said...you asked what Leah was doing and I answered that she could have been alone crying for all I know. If I knew what she was doing the case would be solved, lol. In response to your questioning, I said that she would not have been alone that whole time. The right shoe is indicative that she struggled and fought to keep out of the car she was being abducted in..
She fought tooth and nail to not let her right siide of her body be forced into that car.. I find it unlikely that Nick wouldn't have seen the shoe laying there on any of his trips to the Haga's. Also, the Hudson Ridge area and Lee Valley Rd. were hang-outs for kids, which to me supports the idea that this was not done by a stranger to the area. I'm not saying that it couldn't have happened like you say, those are just doubts that I have. No, I didn't feel as if you were attacking me at all. But, I find it difficult to express an opinion in this forum. it seems another poster wants to dominate and attempt to discredit anything anyone else might have to say about anything. I and other posters are accused to posting things we never posted....the poster in question seems to feel as if they can post any conclusion they want to without knowing the actual facts and demand everyone else to accept it as fact. This poster has posted much misinformation, quoted people connected to the case as saying things that were not said, etc, etc, etc. When called on it by others, she just ignores it and blows more smoke. I thought this would be a good place to come and share opinions, etc. it should be, but it isn't. I don't come here to defend anyone, haven't pointed a finger of guilt at anyone...hence my screen name "noagenda". But because I don't necessarily agree with someone, they accuse and condemn and it's actually funny...because they know nothing at all about me. But you wont take any responsibilty that you have said these things ..
All i have said is that you make my point which is that ppl where you are likley have preconceived notions from what they have been hearing for 10 yrs..
Aj are you saying Nick shouldn't of been interviewed by LE 10 years ago? It would depend on Nick's statement of what street he drove on and whether or not he saw a shoe. I thought it would be likely that he drove both ways since he was looking for Leah, and that would also make it more likely he would take notice of the shoe and find it unusual. People have been known to do heinous things to those they love so I can't generalize it that no one would dump someone they care about. It suggests to me a quick disposal. It would have been very unwise for him to move the body once he knew he was under suspicion by LE. What it said was that Mark flagged down Nick... he asked him if he saw Leah where Mark said ya.. The tbird accounts that are in the docs talk about seeing Nick driving.. they never say anything about anyone having a conversation with Nick while he was in any vehicle.. If there was any accounts like this.. I cant see that Nick wud have denied this (especially if he was guilty) ..he wud not have forgootten that ppl will account for him in a tbird when he was dtopped twicew in his mustang..
That's not the doc I was referring to. I'll try to post the one I'm talking about on here. I think this is the slide Little is talking about. If this is true, LE didn't know about the Hunter's siting until July 5th. I wonder if they even investigated enough to know about any of the witness sitings before the first shoe was turned in. It also looks like Kirn talked to Nick at McKay's between 11 and 12 and Nick was in the Thunderbird at that point. It's in part 4 at 29 seconds. You have to be quick to catch it. They showed about 5 or 6 slides in about 2 seconds. I don't think there are any better views of that slide than what I caught. Thank you J4A, that is the doc I was talking about. I'm really disappointed in the original investigation. Reaves says Leah was not considered a runaway but I think it's apparent the investigation was not in full swing until Leah's shoes were found. I'm sure the statements placing Nick with Leah after 9 are new. Everything else is up for debate, but even if it was known back then, it might raise doubt, but I don't think it would've been enough to go for a conviction. I don't think you get a conviction with no physical evidence and no witness linking Nick to Leah after 9 that night. It's been said (in the more recent investigation) that Frasier gave someone a letter of immunity because that person feared being charged with withholding information. I think that probably happened a lot in this case, people not talking or holding info back, making it very hard for LE to fill in missing pieces. "Why wud Nick EVER have told LE that he didnt switch vehicles if he knew ppl saw him in the tbird.. that is just stupid.. I dont buy it at all.."
In the big scheme of things, it really doesn't matter what you "buy" or don't "buy", does it? AND, people under stress don't always do the "wise" thing which would be to tell the truth. Someone is lying, it's either Nick or the witnesses....take your pick. I don't see the witnesses having much of a motive to lie...but not saying Nick is lying either, because I don't have all the statements on which to base an opinion. But like I said, someone is definitely lying. The statements concerning Nick driving the Tbird that night were taken 10 years ago. So, someone is lying. I believe witnesses who saw Leah or Nick that night and who didn't give a statement at that time would have a hard time trying to recall where they were and at what time 10 years after the fact. However, if someone was involved in the crime itself, or had first hand knowledge about the crime and out of loyalty or fear didn't come forward...I'd think they'd be able to recall everything from 10 years ago. I was once a witness to a horrid crime almost 30 years ago and I can tell you I remember absolutely everything that happened that night. Of course you doubt everything, because none of it supports your theories. But I bow to your long distance expertise with respect to this case. "there are more ppl who had motives and oppurtunity"
For the record, who are these people? Thanks in advance for enlightening me. With all due respect, you are speculating. The DA says he has a cause of death, but has refused to reveal it until the trial. If he's, lying...shame on him. I guess we'll find out. Cause of death has been determined from skeletal remains in plenty of cases. PH is pure speculation. DA has stated he's been eliminated, I'm sure if elimination wasn't adequate the defense will be all over that at trial. Coincidentally, the family of the accused didn't even raise PH as a possibility. Same, same for Robertson....he's also been eliminated. If not adequately, the defense will be all over that as well. "Since when it is up to a grieving family of a murder victim, to crack cold cases" .. I wasn't aware Nick McGuffin had been murdered! Did some inmate "do" a Jeffrey Dahmer treatment on him? I assume you mean the family of the accused? If so, they've revealed a couple of scenarios that don't involve Nick via the local media if you care to research it...none of them involve Horath or Robertson. Where's the Nick McGuffin murdered thread? You are so consumed with Nick McGuffin being a victim in this case that you've FORGOTTEN WHO THE REAL VICTIM in this case is. It's disgraceful. He's not a victim as you just referred to him as, he's a SUSPECT. And the other thread entitled NICK MCGUFFIN DIDN'T KILL LEAH FREEMAN is total garbage...it's based on nothing, you can't even provide me with a link to some of the speculation you printed when so requested. You might have a promising career over at the Enquirer. The McGuffin's don't know about the Jayme Austin case? Gimme a break, it happened in Coquille, a small town, they live in Coquille, the same small town. Are you living in the real world? And I'm still waiting for a link to the Horath timeline you outline in that other despicable thread. "To think that FBI werent called in to help, is another joke... Why the VID SOC???? Whynot porfessionals who have the use of labs, and forensics and experience"
The FBI was called in very early on when it was still a missing persons case. Once Leah's body was found, it became a murder. The FBI doesn't investigate murder cases unless they were committed on Federal Property, or unless they were "hate" crimes. The only assistance they offer is the use of their labs to evaluate evidence. Evidence was sent to the FBI and evidence was also sent to Scotland Yard. So, I'm wondering what you think the FBI should have been doing with respect to this case once it was determined to be a murder investigation? Also, I'm still waiting for the link that outlines the timeline you provided with respect to the movements of Paul Horath on the night of June 28, 2000. I'm not going to comment on the other thread that you guys are discussing because I too find it to be in very bad taste. If Nick had already been tried and found not guilty, I could see it, but while he is awaiting trial for the murder of Leah...well, I think it stinks. I will comment on the other suspects mentioned, though. It's been reported that both Robertson and Horath were not connected to Leah's case. It could be assumed that LE did thorough background investigations on each of them. But if not, I would expect them to be on the defense's radar for sure. As for how they could be eliminated, it would be just like Nick proving he wasn't involved in the Brooke Wilberger case, which he did prove, and the authorities know the specifics, as it should be. AJ, I know you feel strongly about Nick's innocence and I respect that but I think you should consider changing the title of that thread you made. After the trial you can go crazy with that sort of thing. Wow! AJ, did I read right that you now think docs were doctored/altered for the state's case? THIS IS WILD! There's a lot of paperwork, somebody must have been really busy with the white-out! "Who brought the evidence to Scotland Yard? RW aka Sherlock"
"The FBI absolutley cud have remained throught the investigation while Leah was missing.. and even thru the murder investigation"
A couple of final observations before we part ways....if you knew as much as you think you know about this case you'd know the answer to the first question. and, it is you that's wrong with respect to your second statement. The FBI, by their charter, cannot investigate murder cases under local jurisdiction...only missing persons or kidnappings. "Murder is not a federal crime, and therefore, a death suspected to be a murder would not ordinarily be investigated by any federal agent, absent some special jurisdiction to do so, however, there are many circumstances under which such jurisdiction would arise. The most obvious would be if the death/murder occurred on US government property. Deaths on military bases would generally be investigated by the respective military branch's similar investigative branch (ie: NCIS in the Navy, etc.). The FBI could also take jurisdiction if the death involved a US Government official, theoretically right down to your USPS letter carrier. The FBI can also claim jurisdiction in an investigation if there is suspicion that there has been a violation of another federal law at the base of the crime, most usually the violation of the victim's civil rights. Such is usually the case when the murder is suspected to be racially motivated, part of an organized crime syndicate's activities ("RICO"), etc. Kidnapping across state lines is a federal crime, as is narcotic trafficking, trafficking in prostitution. Also, the FBI makes itself available to assist local and state authorities in murder investigations upon request when it's superior investigative resources (laboratory analysis, DNA, etc) can be of vital assistance. Lastly, in a way that sometimes blurs jurisdictional distinctions, the FBI also have a tendency to get involved when the victim is from a prominent, politically connected family." Actually, you said I was a resident, but that's cool. You're freaking me out a little with all your accusations of gross misconduct on the part of ALL authorities in this case. Unethical behavior, tampering with evidence, planting evidence, it's crazy for me to think that all the different officials and agencies involved would be complicit in that. I need to take a step back and think about if I should even continue discussions here. This case will be tried in a court of law and it might do well to remember that. "Leah was missing .. for 37 days.. The FBI shud have been involved in the entire investigation.. Even if it wasnt until Jul 3 when the first shoe was brought in.."
I'm pretty sure the FBI was involved from the time they were called in until the case turned into a murder investigation. Just because you think they should have stuck around doesn't really count...you see they can't investigate murder cases under local jurisdiction...they only provide technical support, etc....what about that don't you understand? Not really a question. Also, I'm sure the FBI had compiled lots of reports and performed lots of interviews, none of which we, the public, are privy to. So let's just wait for the trial and see what evidence is presented before making wild accusations about this that and the other thing. I really think you only see what you want to see. I'm also have concerned about the safety of this site and my account..
Edit Admin can u please delete my account, see above for reason, but i must stress i want it deleted if possible thks.. I'm with ya prayerbone. This particular forum is nothing more than a tool for propaganda, pure fiction, a total disregard of any existing facts and wild speculation. It's not about Leah Freeman at all and I can't believe a Forum Administrator would actually take an active part in helping to promote this nonsense, much less allow it happen. This is the most ridiculous forum I've ever seen and I want no part of it. prayerbone wrote: Ok i'm bailing out,its become the AJ rant, its not a conversation any longer..
First I want to say that this is an 18+ site. I am repeating myself here, but I like to think that we ARE ADULTS and can have ADULT conversations. If you don't like something that another poster writes....IGNORE IT. You can either just pass it by or better yet, use the "FOE" in your profile & you won't even SEE the posts by that poster. EVERYONE is entitled to say what they want.....unless you attack someone. Your wish is my command. Anyone else? We have no "spelling police" and if something so silly as spelling bothers you...well, I guess it's better that you are no longer a member here.